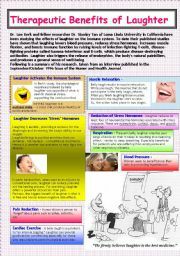 Do you know how laughing can benefit our health? read this article and find out! Brand names and their commodities. 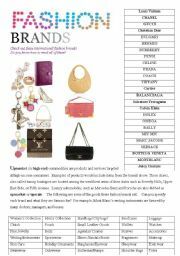 An article/worksheet for fashionable and Trendy students to learn the correct pronunciation of Brands. It also helps the students recognize some vocabulary these branded companies use for their websites. How is Homer Simpson feeling? 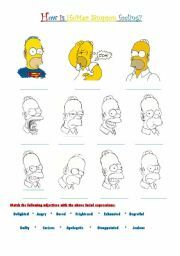 Very simple game with adjectives about how Homer feels. What makes a society "Great"?? 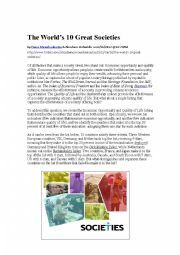 This is an article from Forbes magazine about the world�s 10 greatest Societies. Students can discuss about what makes a great society and see if their country made it into the list. It contains some advanced vocabulary and discussion questions. Have you ever wondered just how honest your coworker, best friend, or lover was being? Can you tell when someone is lying to you? In this lesson, we�ll talk about ways people can detect a liar - or appear to be honest - and discuss some interesting idioms related to lying. This is an useful phrase to teach students. You may use this printable as a poster, a reading material, or put it into a phrase book. 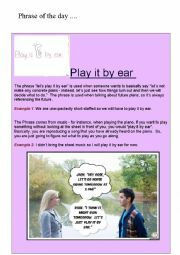 Tell your students how to use "play it by ear" in a conversation. 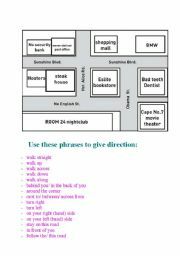 This is a very simple Map for ESL students to learn how to give simple direction using the phrases provided. An exercise for students to express feelings in the past tense. 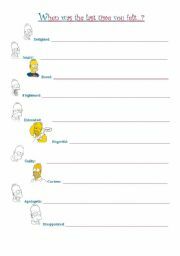 This is a worksheet for people who loves "The Simpsons". It is definitely worth downloading. 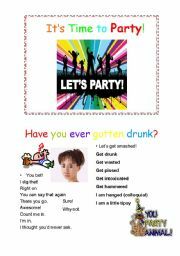 Party Fun (part 1) provides some words and ideas you can use for a conversation about parties. 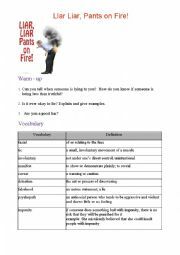 It�s a Good and fun exercise to get the students talking. What does the color blue makes you feel like? What are the connotations of purple? How do you feel if you were in a red room? On each of the following slides, you will see a picture and some questions. Make your students describe what they see in the pictures. Then make their own question about the picture to ask their classmates. Let�s share useful tips on how to have a successful dinner party!